Heart of the Story:Zimri, an Israelite man, brought Cozbi, a Midianite princess, to his family in the Israelite camp. 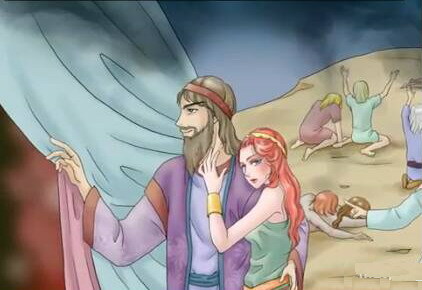 After the couple went into the family tent, the priest Phinehas entered the tent and drove a spear through Zimri into Cozbi’s body. Back Story: Immediately before the story of Zimri and Cozbi, the Israelites killed 24,000 Israelites who joined in worshiping Baal of Peor. The worship included sacrificing to Baal and engaging in sexual immorality with Moabite women. Most of the dead Israelites were from the tribe of Simeon. The Israelites believed that the Midianites were in league with the Moabites who enticed the Israelites to worship Baal of Peor. Zimri was the son of Salu, a leader in the tribe of Simeon. Cozbi was the daughter of Zur, one of the five Midianite kings. When Zimri brought Cozbi into the Israelite camp, Moses and the entire assembly were at the Tent of Meeting weeping over the death of the 24,000 slain Israelites. The Bible doesn’t record any conversation between Moses and Zimri; however, one commentator suggested that Zimri confronted Moses, asking why Moses could marry a Midianite woman and he couldn’t. While a shepherd for the Midian priest Jethro, Moses married his daughter. Analysis of Relationships:The Bible doesn’t identify Zimri and Cozbi as husband and wife. Perhaps, they were married according to Midianite traditions. Cozbi was the daughter of a king. Probably, Cozbi wouldn’t leave her people to live with an Israelite man unless a solid relationship was in place. Zimri didn’t hide Cozbi, nor was he ashamed of his relationship with her. He treated her as he would a wife. He brought her into the Israelite camp in front of Moses, priests, and assembly. He took her to his family and into the family tent. Despite Zimri and Cozbi’s feelings for each other, Zimri couldn’t have chosen a worse time to bring his Midianite princess home. The Israelites were in deep mourning for their dead and vehement about pleasing God. They saw Zimri’s bringing Cozbi into camp as a sign of contempt for God and defiance of Moses’ leadership. Further, Zimri liaison with Cozbi had political implications. When the Israelites moved, 3 of 12 tribes were positioned on each side (north, south, east and west) of the Tabernacle located at the center of the marching group. Gad, Reuben, and Simeon guarded the southern flank with Simeon’s location on the southeast corner of the Israelite. As the Israelites made their final march from Moab into the Promised Land, the Midianite land was southeast of the marching Israelites. Had the union endured between Zimri and Cozbi, Israel’s security and even unity would have been endangered by having a Midianite enemy among the Simeonites (Sicherman, 2008). Zimri was a smart man; he was the son of an Israelite tribal chief. Zimri knew the Israelites just killed 24,000 of their brothers because the men were enticed to worship idols by foreign women. Zimri was wrong to flaunt his relationship by bring an Midianite woman into the Israelite camp. Reflection: Given the mood in the Israelite camp, what did Zimri think would happen? Perhaps, Zimri was so enthralled by his lust for Cozbi that he simply wasn’t thinking clearly. Copyright: Carolyn A. Roth 3/14. This entry was posted in Husband & Wives and tagged Cozbi, God, husband and wives, Israelites, Little-Known Bible Character, Midianites, Obscure Bible Characters, Simeonites. Bookmark the permalink.